Your virtual office for a successful teamwork! Create a virtual office exclusively for your team! 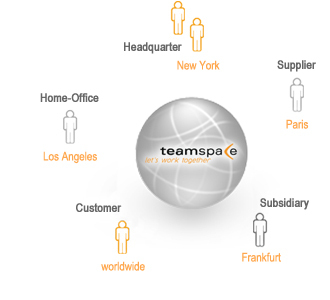 teamspace enables companies and working groups all over the world to coordinate, co-operate and communicate without any restriction. Providing a trusted and user-friendly solution, we developed a virtual office that allows creative and simplified teamwork over the internet, worldwide and at any time. teamspace has carefully designed solutions to link together professionals within teams, who are separated either by organizational structures or geographical aspects. We are able to help our clients to operate in an efficient and effective manner. We do this by providing an advanced infrastructure that will deliver extensive communication, coordination and cooperation possibilities. Furthermore, we provide the possibility of using teamspace in the form of an Enterprise Server. This option provides your company with its own portal for virtual teamwork, either through your personalized Intranet or using an own server on the Internet. teamspace is the all-round collaboration solution for every working group. The software is very versatile, can be used every where and every time and offers for companies of all sizes and branches the suitable solution. And this all for a very good prize.